Helping To Keep Your Industrial and Commerical Facilities Running Safely & Efficiently | My Asphalt Dr. The Capital Building and Facility Maintenance Show will be held on Nov 15-16 at the Dulles Expo Center in Chantilly, VA. The show is positioned to serve the needs of Facility Management and Maintenance professionals as well as Plant Engineering and Industrial Maintenance Professionals from across the DC, VA, and MD region. This is a free, two-day trade show that features educational seminars designed to bring the latest information on the products, technologies and services today’s maintenance and repair operation professionals need. This is a great opportunity for those responsible in keeping their commercial, educational, hospitality, industrial, office, medical, and municipal, retail or residential buildings and facilities running safely and efficiently. 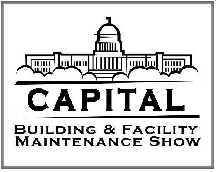 Visit the Capital Building & Maintenance Show for more information and to see who is exhibiting. FYI: Alternative Paving Concepts will be located in booth 612.